Opening a new brewery is not an easy task, especially in Buffalo’s changing craft beer landscape. The rise in popularity of craft beer has plucked people from prior professions and united them with a common goal: making beer that people want to drink. Breweries of all sizes and business models are popping up across Western New York. Some are content making relatively small batches of beer, while some are fueled by desires to become the next regional or national brewery. The local market is ripe with opportunity. To date, no brewery has withered on the vine and profits are being plucked. But it’s still necessary to differentiate your brewery from the competition. And you still need a considerable capital investment just to get started. This is where 12 Gates Brewing Company comes into focus. Its business model is simple- make IPA… and make a lot of it. The Williamsville-based brewery began distributing its IPA-laden lineup last December. Signs on the highway cleverly marketed the 12/12 distribution start date and its tap room opened nary a week later on December 18th. The idea of opening 12 Gates Brewery was started by Tom Kirchmeyer and Todd Wilhelm. As the idea grew, so did the investment. Other partners– a total of eight– were brought in for assistance in various areas. The owners have adopted a “divide and conquer” mentality and everyone has a role whether it be tending to financials, seeing to legal aspects or managing the front end of the house. One of the eight part owners is Williamsville-native Kevin Lalock. In college, Lalock studied financial management and business administration, but he has always been involved in the restaurant business. Lalock worked at Shannon Pub in Tonawanda and spent 22 years working at J.P. Fitzgerald’s in Hamburg. Lalock runs the front end at 12 Gates; he is in charge of tap room and kitchen personnel. His other duties include managing inventory of beer, food, wine and merchandise in the tap room. Lalock is also in charge of promoting the tap room and has visited local businesses to promote the brewery. His typical day starts at 9 a.m. and various tasks often keep him at the brewery until late at night; a 13-hour day is not uncommon. Despite the fact that working at a brewery is more time consuming than he anticipated, Lalock said he wouldn’t change a thing. In addition, there are perks to working in a brewery. One of his favorite aspects of owning a brewery is the opportunity to meet different people. “We want to meet people who love beer, who want to talk about beer and want to have a good time,” said Lalock. Despite being open for only a half year, 12 Gates Brewery has already gained significant popularity, especially among “hop heads”– drinkers that seek out beer packed with bitter, citrus, floral and pine aromas and flavors. Scott Shuler, Head Brewer at 12 Gates Brewing, pours two IPAs at a recent festival. The majority and focus of 12 Gates beer is IPA, including West Coast IPA, Under the Southern Cross IPA (USC), Session IPA and Oak-Aged USC. However, domestic beer drinkers are welcome and 12 Gates hopes to assist in their conversion to craft beer by offering gateway beers such as 12 Gates White or Water Mill Pils. Indeed, while West Coast IPA is the top seller at local bars and restaurants, the top seller in the tap room is 12 Gates White, a Belgian witbier containing flaked oats, rye, coriander and sweet orange peel. 12 Gates also offers Coffee Porter, a rich and chocolately beer made with micro-roasted, cold-brewed coffee from Glen Edith Roasters in Rochester. To appease the non-beer drinking clientele, 12 Gates also offers local made wine. “We want people to drink local beer, so why not support the local wineries as well?” said Lalock. Although the brewery had initially planned to grow gradually, 12 Gates Brewery has 110 accounts. 12 Gates is also the craft beer sponsor of Lancaster Speedway and the Taste of Williamsville. In order to meet increased demand and sales, 12 Gates will begin canning its beer by summer. Cans offer consumer convenience as they will not break at your backyard BBQ and they also keep sunlight out, thus avoiding the dreaded ‘skunking’ of beer. However, increased production comes with increased risk. Making IPA is one thing, but making enough IPA worthy of high-throughput distribution is another. “We pride ourselves on being a hop-forward high-quality brewery in Buffalo,” boasted Lalock. 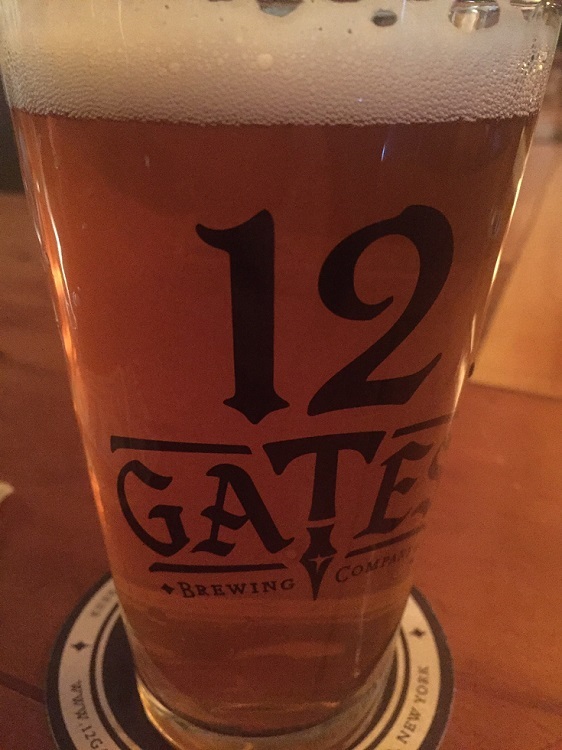 The majority of 12 Gates’ beers are IPAs. While there is a strong sense of camaraderie among Buffalo breweries, its safe to assume that competition exists at some level. Lalock posited that the real winner of this competition is the consumer because demand drives the production of high-quality beer. While other breweries existed in other Buffalo suburbs, Williamsville had remained untapped. Lalock doesn’t believe the market is saturated and there is still plenty of room for more breweries. Because 12 Gates Brewery is classified as a microbrewery and not a brewpub it has to abide by industrial zoning regulations. Therefore, 12 Gates is tucked away toward the back of an industrial zoning park. Lalock stated one of the challenges 12 Gates faced was getting people to find the brewery. This required all types of promotional techniques, including going door-to-door and passing out coupons to Williamsville residents. Follow the breadcrumb trail of posted signs off Wehrle Drive just past ECC North and you shall find 12 Gates. This is an interview in a series of guest entries by students in the Practical Brewing class at Erie Community College. Students were asked to conduct an interview with a person of their choosing in the brewing industry. Jonn Rashko conducted this interview as part of his requirements for a state certification program in Brewing Sciences and Services at Erie Community College. Born and raised in Western New York. Ph.D. in Biochemistry. Professor of Microbiology and Chemistry. And lover of beer. Thank you! Hope to see you tomorrow.